Billy Sunday: You think you're better than me? Carl Brahsear: You're damn right I am! - Robert De Niro and Cuba Gooding Jr.
Stars: Robert De Niro, Cuba Gooding Jr. When I am stuck as to what type of film to see, the "based on a true story" tagline doesn't exactly get me running to the theater. My largest problem with a movie focusing on true-to-life events is that it becomes inevitable for the filmmakers to take liberties with the story. While this is acceptable to a certain level in pictures dealing with historic events that happened many moons ago (Braveheart, Gettysburg, etc...) it is entirely pointless to fill in the gaps of more recent events (Ghosts of Mississippi). With Men of Honor, it is hard to say whether or not the events that happen in the film truly took place; but for once it is beside the point. This is such a well-acted and well made film that debates on its authenticity become secondary. Director George Tillman's second feature, Men of Honor tells the story of Carl Brashear (Gooding Jr.) and his efforts to become the first man of color to ever hold the rank of Navy Diver. After years of letter writing, Carl is finally accepted into a tough training class run by Master Chief Billy Sunday (De Niro). The Master Chief is naturally as resistant as anyone to Carl's efforts, but in private praises the work done by his only black student. Throughout his time at the training academy, Carl overcomes several seemingly impossible obstacles, the least of which is a seventh grade education. While this brief synopsis only covers half of the plot, there are more events that take place, but to explain them here would be to spoil the film. Men of Honor is far from being a great movie, but it succeeds none the less. The main flaw of the film is that the characters are all entirely one-dimensional. There are clear-cut bad guys and good guys, with little in between. In a film like this, Brashear would have gone through several changes mentally, yet he remains the same throughout. Only De Niro's Billy Sunday shows more than one shade of personality. The most curious element is that Sunday is a creation of screenwriter Scott Marshall Smith, which is perhaps a reason why he never does mesh with the rest of the cast. By interweaving several suspenseful action sequences with moments that are both touching and humorous, the direction by George Tillman is part of what makes the movie work. Yet while Tillman's work is accomplished, it is a shame that the screenplay is never on par with the direction. There are several emotionally overwrought moments, as well as more than a few long speeches that cause the film to occasionally meander. For anyone doubting that high caliber acting can lift a mediocre movie to new heights, there is concrete proof with Men of Honor. The performances by both Cuba Gooding Jr. and Robert De Niro make the film what it is and the price of a rental is justified when each of these actors are on the screen. De Niro, who has been seemingly sleepwalking through his recent films, plays Sunday with a good balance of evil and concern. He has a great scene in a bar with Brashear where, while yes, he is playing it over the top, it is the high quality over the top acting that only Bobby D can bring to the screen. Gooding Jr. is also very good, so much so that I can honestly say that his acting in this movie surprised me. All too often, Gooding has an intensity that never fits in his pictures; here, he dials it down and has a calm understated performance that works. Charlize Theron is wasted in the role of Mrs. Sunday, as she has little to do in her total of five minutes on screen. It rest on De Niro and Gooding Jr. to carry this film, and they do so with aplomb. Image Transfer Review: By the time I got around to seeing Men of Honor in the theater, the print was of such poor quality that you couldn't see the characters for the scratches. I am glad to say that this new 2.35:1 anamorphic transfer is absolutely stunning. The most amazing aspects of the transfer are the extraordinary, spot on detail and sharpness. Colors are also vibrant, with the blues of the ocean and gray of the battle ships coming off beautifully. Pixelation is never a factor and while there is some slight edge enhancement, it never becomes a problem. Audio Transfer Review: Presented in Dolby Digital 5.1 surround sound, Men of Honor has a surprisingly active audio track. Perhaps the focal point of the track, the dialogue sounds clear and is never muffled or hard to understand. Mark Isham's score fills the surround speakers with clear crisp sound. Other ambient sounds are also noticeable throughout the track. But perhaps the most surprising aspect of the track is the .1 LFE channel. On two occasions the subwoofer hits hard and loud. In particular, a moment early in the film where a ship sinks and the crunching of the hull can be felt. A Dolby 2.0 track can be hears in either English or French. Extras Review: A commentary track featuring director George Tillman, Jr., producer Robert Teitel, writer Scott Smith, and Cuba Gooding, Jr. highlights a feature-laden disc from Fox. While not as informative as I had hoped, it does tell some interesting production stories by Tillman and the producer. Gooding, Jr. chimes in with stories about Brashear and what it was like to play him. Most notable is that it seems the track was recorded with everyone present at the same time, thus providing no gaps. Next are twelve deleted scenes that can be viewed with or without commentary by Tillman. Tillman is also seen at the start discussing his longer cut of the film, as well as why the scenes were cut. The Making of Men of Honor is a straight-forward, promotional documentary that features interviews with the cast and crew as well as Carl Brashear himself. While the interviews are informative, there is nothing here beyond the standard promotional aspect. Master Chief: A Tribute To Carl Brashear is a documentary that goes into detail about the real Carl Brashear, and is quite possibly the most interesting extra on the disc. Showcasing his life, from childhood to his career as a diver, lasts a short seven minutes. Director George Tillman provides a short animatic for the underwater search sequence with commentary. Two trailers, a short music promo, a video for the Brian McKnight song, Win, as well as two television spots round out the extra features. Halfway through Men of Honor, a friend of mine joked that the film was more or less Rocky Balboa in a diving helmet. 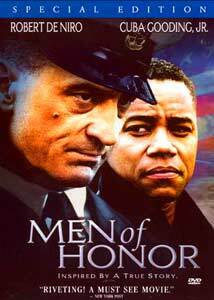 He was right, but it is hard not to like Men Of Honor when you take into account the work of De Niro and Gooding, Jr. The transfers are great and there are some very nice extra features, especially the deleted scenes and commentary track. Do yourself a favor and pick up this disc.